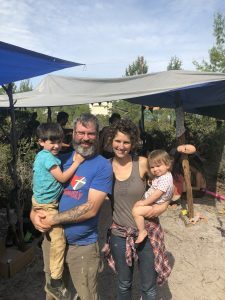 Jesus Kitchen – Ocala 2019 | Source MN, Inc.
Jesus Kitchen speaks God’s love and forgiveness to the at-risk and unreached. Young people dealing with homelessness, addictions, and abuse typically do not come into a church or look to Christians for answers. However, hundreds of the most marginalized are served by the Jesus Kitchen every year. 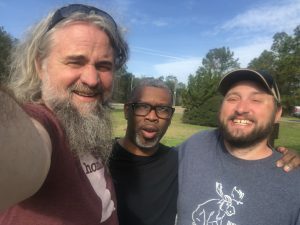 Ocala National Forrest, Florida, along with Minneapolis, Alabama, and the Rainbow Nationals (Hosted in MN/WI this summer for the first time ever), are all part of the Jesus Kitchen annual travels. Ben and Teresa Pothier travel with the Jesus Kitchen across the country. Homeless youth, young travelers and modern day vagabonds migrate to Ocala National Forrest, Florida every winter. A camp site, Serving 100’s of meals, prayer/worship around the camp fire and dozens of conversations about God’s love, forgiveness and redeeming broken lives are part of the Jesus Kitchen daily. This last February, Executive Director Peter Wohler along with Outreach Coordinator Jon Willis (and former staff Keith Haugan), joined the Pothiers and the Jesus Kitchen in Ocala for an incredible outreach. Within 5 minutes upon their arrival they came upon an intoxicated young women having a seizure alone and unattended. They were able to assist her to the main road and get an ambulance. Ocala is a strange mix of meeting the need for belonging and “home” to individuals that are considered the outcasts of society– however, the subculture can only provide ways to mask the pain and not bring the hope of finding value and worth in a relationship with God which our hearts long for. Baptisms, reuniting pregnant teens with family, bringing young people to transitional homes and connecting individuals with local churches have been part of the Jesus Kitchen outreach. We have also seen many conversations and individual prayers of God’s love and forgiveness and how a relationship with God can redeem your life. Along with many conversations of how faith in Christ can practically help you, is about a relationship with a God that loves you verses a religion of rules and prayers that God would reveal himself – we also come in contact with many ‘prodigals.’ Individuals who have already made a commitment to follow Jesus but are now on a path far from God because of bad choices, circumstances or abuse. They are in a cloud of shame and believe that the church and God would not want anything to do with them. For some to hear that God still loves them and wants them in His family is almost to good to believe. Cray spent most his time at the camp site. Engaged in prayer/worship, devotions from the Bible, helped out with camp chores and serving food, and received council and prayer for his future. Cray represents one of the many “prodigals” that exist today. They are wondering, desiring to return to a God of love and forgiveness, but they do not know the road home. They do not know any Christians they can relate to or they can trust. 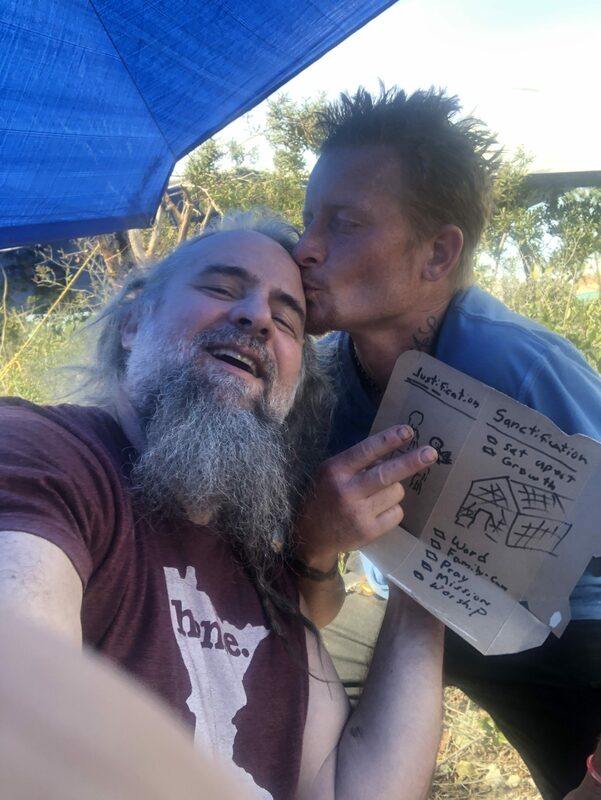 On Peter’s last day in the woods, gathered 5 different “prodigals.” A couple that was living in poverty with their daughter, 2 other young men, and Cray. Peter shared about Justification and Sanctification. Bible verses that talk about God’s plan to have us stay connected, continue to grow and bear healthy fruit. Cray and the others seemed to hang on every word and received prayer with tears. Cray asked if he could have the peice of cardboard, Peter was using as a teaching sketch. Pray for the National Homeless Youth Outreach and the Pothiers travels throughout the year. Conviction and revelation to the many at-risk and unreached young people that as they search for belonging and ‘Home,’ that they would receive Jesus and find some people that they can relate to and trust. Opportunities here in MN this summer. The Rainbow Nationals will be hosted in MN/WI for the first time ever. Over 30,000 will be in attendance mid-June to July 4th. 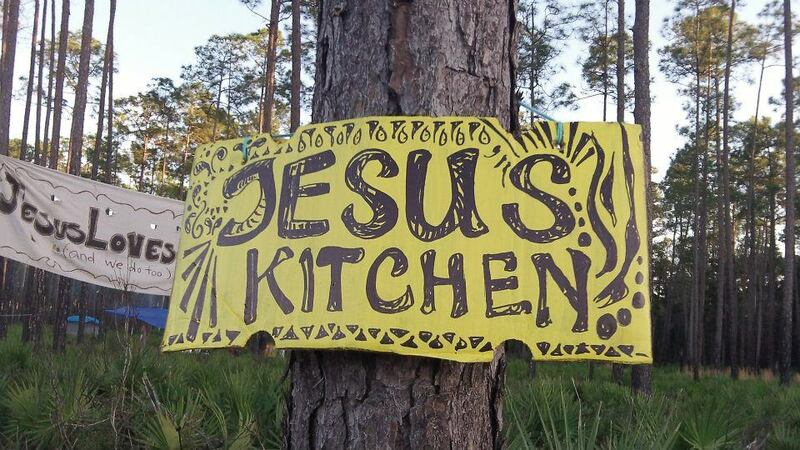 The Jesus Kitchen will need lots of prayer, volunteers and resources. Contact us for Volunteer opportunities, providing food and prayer gatherings later this spring and summer. Email info@sourcemn.org for details.